The Step Pyramid was built during the Third Dynasty as the tomb for Pharaoh Djoser. It was designed by the famous architect, Imhotep, who was later deified. The Step Pyramid stands at a height of 204 feet (62 meters) with six stepped layers. It was the largest building of its time. Here limestone was first used on a large scale as a construction material and the idea of a monumental royal tomb in the form of a pyramid was first truly realized. It can be said without exaggeration that the Step Pyramid complex constitutes a milestone in the evolution of monumental stone architecture, both in Egypt and in the world as a whole. After the Step Pyramid was built, the successors of Djoser began to build pyramids as their tombs. Prior to the Step Pyramid, pharaohs were buried in mastaba tombs, large rectangular monuments. However Imhotep, Djoser’s vizier, decided that his pharaoh needed a more impressive tomb. He came up with the idea of stacking mastabas on top of one another, while decreasing in length and width. The Step Pyramid got its name from this stepped design. Like the previous mastaba tombs, the burial chambers are beneath the pyramid. Below ground, the Egyptians created an underground structure on a scale previously unknown, quarrying out more than 3.5 miles (5.7 kilometers) of shafts, tunnels, chambers, galleries, and magazines. A central corridor and two parallel ones extend over 1,198 feet (365 meters), connecting 400 rooms. 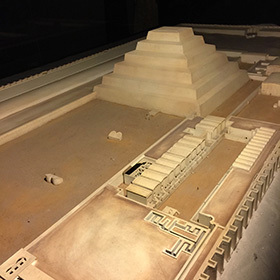 Image: Step Pyramid model in the Rosicrucian Egyptian Museum.